Organizations that promote a culture of purpose in their workforce experience better engagement, higher employee retention, greater openness to diversity and inclusion, and a stronger resilience to change. In this webinar, featuring world-renowned leader in the field of purpose-driven behavior change Vic Strecher, PhD, you will learn the latest developments in the groundbreaking field of purpose science and take away some simple steps to help you and your organization unlock the power of purpose. 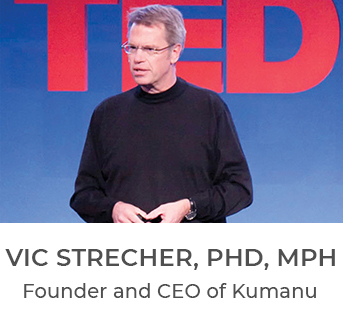 Dr. Vic Strecher, Founder and CEO of Kumanu, has been a Professor at the University of Michigan School of Public Health since 1995. He founded the Center for Health Communications Research and has been leading investigator on over $45 million in grant-funded studies. Currently, as the Director for Innovation and Social Entrepreneurship, Dr. Strecher is helping the University of Michigan disseminate research to the real world, improving the public's health nationally and globally. Having difficulties signing up? Get in touch with us at info@kumanu.com.